Withstands sideline traffic, even metal cleats! FieldSaver Football Sideline Tarps provide unmatched protection that withstands sideline traffic from players with cleats, coaches and equipment. Both fabric styles - ArmorMesh and Heavy-duty Blanket - help prevent costly damage to your turf. Show off team pride and enhance your field with TuffPrint ultra durable customization to display your team name and/or logo. 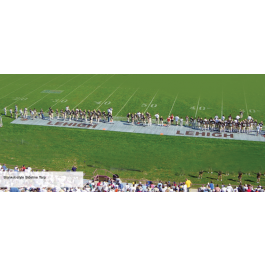 Add a team line (‘get back’ line) to designate coach and player areas, as per NFL and NCAA policies. Choice of 2 weights – Premium 15 oz. and Standard 12 oz.